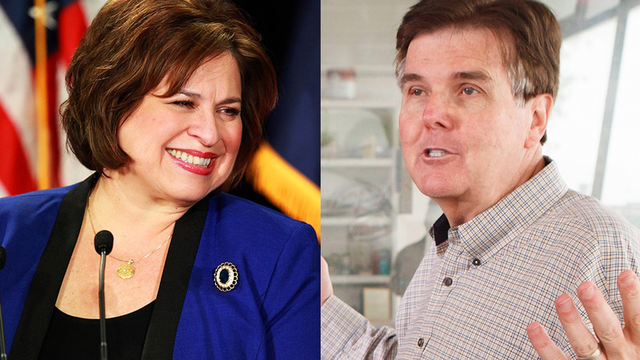 State Sen. Leticia Van de Putte, the Democratic candidate for lieutenant governor, said Wednesday that her Republican opponent, Dan Patrick, was “rewriting history” by taking credit for the restoration of billions of dollars in cuts made to Texas’ public education system. During a news conference at the Texas State Teachers Association offices in Austin, Van de Putte criticized Patrick for saying he supported restoring some of the $5.4 billion in education spending cuts made in 2011. She pointed to Patrick’s vote against the state budget that restored some of that funding last year, saying Patrick's claim "is absolutely false." But Patrick’s campaign said his vote against the state budget was related to his concerns about overall spending, not the restoration of education funds. "As Chair of the Senate Education Committee and a member of the Senate Finance Committee last session, Senator Patrick voted for an increase in education spending both in committee and on the floor," said Patrick spokesman Alejandro Garcia. After a Travis County district judge ruled the state’s school finance system unconstitutional last week, Patrick said he “led the charge” to restore education funding during the last legislative session as Education Committee chairman. He has also said he voted against the state budget because it lacked funding he requested for specific education programs. State lawmakers were at odds in 2011 when the Republican-led Legislature passed a state budget that cut billions from public schools. Van de Putte said Wednesday that Patrick was more concerned about his “political scorecard” when he voted for that state budget and then against the budget that restored some of that funding in 2013. “The problem with these comments is that Patrick was directly responsible for these same education programs not being funded. Such revisionism cannot go unchallenged,” Williams wrote. The issue is sure to give candidates a key talking point as they head into the last two months of campaigning. Despite the Legislature’s move to restore some of that funding last year, it has left candidates at partisan odds when discussing how to improve Texas’ public school systems. Van de Putte has said the state must fully restore the education cuts and further increase funding to Texas schools. Meanwhile, Patrick has indicated that he would be apprehensive about providing additional dollars to schools that have failed to meet their marks.